Xiaomi has already confirmed the launch of its upcoming flagship smartphone, the Mi 9, to be held on February 20th. The rumour mill, however, has remained as relentless as always, keeping up the steady inflow of leaks pertaining to the device. 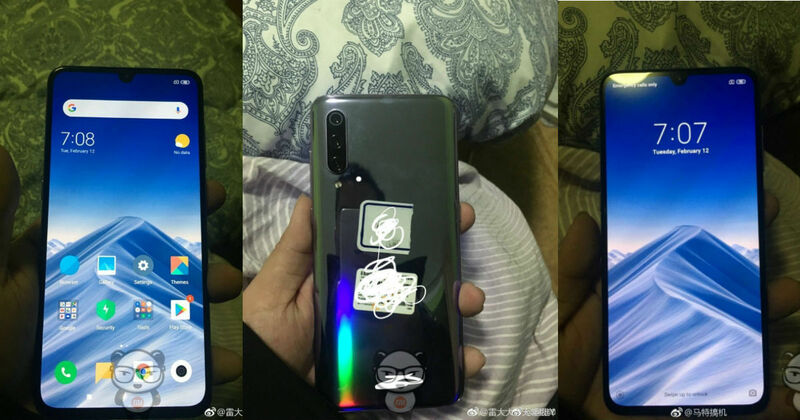 The latest report shows purported images of the device from both the front and the rear, showing how the upcoming premium device from Xiaomi is shaping up. As per the images, Xiaomi has gone for a safer approach with the Mi 9. It has retained a typical flagship smartphone design of the present day, with a thin bezel for the bottom chin of the smartphone, and narrow bezels all around otherwise. While the Mi 8 featured varying notch designs, the Mi 9 is expected to only come with a waterdrop notch to house the front camera. It also appears to be finished with a gradient paint job, which is also becoming seemingly common in the premium smartphone segments. The Xiaomi Mi 9 is expected to be powered by the Qualcomm Snapdragon 855 flagship SoC, but will almost certainly not include the optional X50 5G modem. It may include up to 8GB of RAM and 256GB of storage. Its rear camera has been heavily touted to feature the new 48MP Sony Quad Bayer image sensor, which brings pixel binning to implement better low light and high resolution photography. In the live images seen in this leak, the triple camera unit is visible, containing all the three camera units in a single housing, and a single, dual-tone LED flash underneath it. The live images do not include a fingerprint sensor at the rear, which possibly confirms the presence of an in-display fingerprint sensor. The Mi 9 is slated to launch alongside Samsung’s flagship, the Galaxy S10. While Samsung is seemingly going all out with its flagship, Xiaomi appears to be taking a more conservative route with the Mi 9. Nevertheless, the company has a bunch of interesting projects at hand, including a foldable smartphone and 5G-enabled devices.